Talking and listening a cycle! Both talking and listening are very much a gift but can be defined also as a rare talent. Do you use your gifts and talents wisely for the purpose of why you were given them in the first place? When you talk, is it because you like to hear the sound of your own voice? Or are you sharing your wisdom and knowledge? Are you talking in the best way you know how for the person or persons who are in your audience or company? 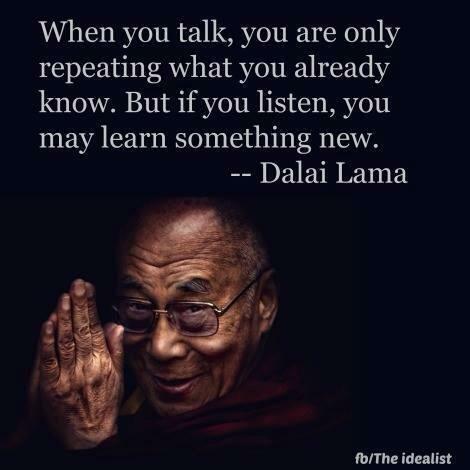 When you listen, is it something you do because you are interested in what others have to say? Or do you do it out of courtesy? Or is it because you want to learn and maybe in turn talk about what you’ve learnt? And so it is that the cycle goes on! Become the best listener you can be, so that you can become the best talker that others want to listen to! < Previous Letting go of the fear!